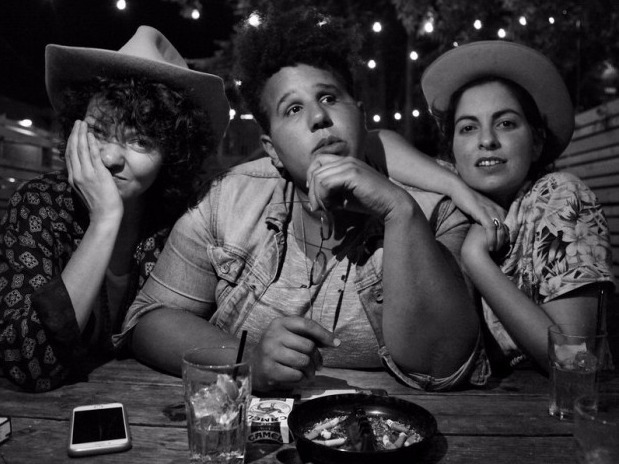 There are a lot of diehard Alabama Shakes fans who will listen to absolutely anything Brittany Howard chooses to lend her musical talent to, regardless of genre. And I am one of them. There's been mentions of her collaboration with singer-songwriters Becca Mancari and Jesse Lafser for a while, but no one quite knew what to expect of the newly formed group (which goes by the name Bermuda Triangle) until a few videos of their debut show in Nashville showed up on YouTube in July. "Rosey" is the first studio recording of their work. It's very light on Howard's distinctly powerful voice--in the YouTube videos of Howard performing the song, she's playing the upright bass, which is unusual for her, though it sounds beautiful in the song. The vocals are mostly a harmony between Mancari and Jesse, who also play acoustic guitar on the track. "Rosey" also appears to feature traces of a drum machine, which gives the track a different sound than if they'd gone the traditional drum route: instead of being a pure nostalgic folk track, it gives it an updated feel. Despite inserting some electronic instruments into a traditionally acoustic genre, Bermuda Triangle doesn't break too many rules. The trio doesn't have the wild energy of Alabama Shakes--at least, in this track. "Rosey" is a poetic song that focuses on the trio's strengths as songwriters and musicians. Let's hope this is just the beginning of something beautiful: Bermuda Triangle goes on tour in the Georgia, Alabama, Tennessee and North Carolina for a week this October, where they'll hopefully be trying out songs that eventually make it onto an album.